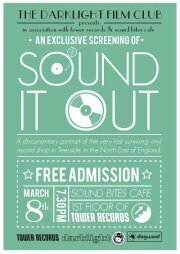 Darklight Film Festival in association with Tower Dublin and Soundbites cafe present A very special Free screening of Sound It Out Thursday 8 March 7.30PM in Soundbites Cafe, 2nd Floor Tower Records, Dublin. If you were unlucky enough to miss the sold-out screening of Sound It Out at Darklight 2011 we’re delighted to announce this very special screening. Admission is Free and open to all.